In this video interview, hear Metis Seattle graduate Susan Fung tell the story of how she selected Metis vs. academia, plus hear thoughts on her current role with Liberty Mutual and how the bootcamp helped her prepare for it. Recent Metis bootcamp graduate Vicky Szuflita won SwitchUp's quarterly gift card giveaway. As a followup, they featured her in a great Q&A about her background, her time at Metis, and her current role on the data team with the Democratic Party of North Carolina. She previously worked in account planning for an international advertising agency, and while she loved the creative aspects of an agency career, she wanted the skills to strengthen her ideas in a more quantitative way. We recently hosted a Live Online Ask Me Anything session with Metis bootcamp graduate Leon Johnson, a former U.S. Airmen who was recently hired as a Data Scientist at Viral Launch in Indianapolis. He answered questions from those interested in (or preparing for) the bootcamp, as well anyone else curious about his journey and story. Read the full Q&A here, which includes specific questions about his time in the Air Force and his use of GI Bill funds to attend Metis. Bootcamp grad Dan Taber is certainly no stranger to data. Prior to landing his current role, he’d already been working with data for more than 15 years in various academic roles spanning science, technology, and policy. But his hard skills had fallen out of date. Enter the bootcamp as a way to bridge the gap between his academic background and industry ambitions. Read about two recent final projects created by graduates of our data science bootcamp . See what's possible to create in just 12 weeks, including a way to predict which pitches the Cubs should throw to the Cardinals, and how to predict the mode of a hit single on the Billboard charts. Recent bootcamp graduate Gavin King grew up in Arizona, got a Ph.D. in Mathematics from the University of Wyoming, and now lives and works in Seattle, where they’ve found a home in the bustling data science community as a Data Scientist at Zulily, a growing e-commerce company. Read about their journey to the job and how Metis career support helped along the way. Metis Graduate Danny Gilberg is a Data Engineer at Interactive One. 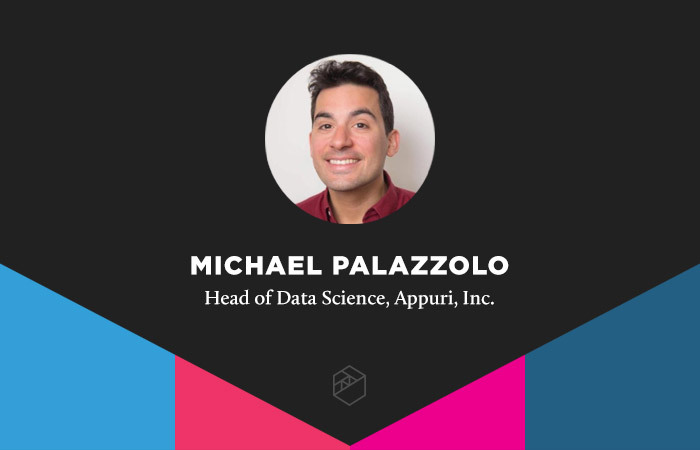 Hear about his path to a career in data science and the role Metis played in him landing his job. In this brief interview, hear Metis grad Dangaia Sims tell the story of her transition from academia (Ph.D., Kinesiology) to industry and how the bootcamp helped her get there. Take a look around and you might notice some waste. It could come in the form of something physical that you can see or feel or smell. Or it might be invisible to the eye, like wasted time or resources due to lapses in efficiency. Two recent Metis graduates took an interest in these different forms of waste and used data science to come up with ways to minimize negative impact and maximize positive solutions. Academia to Data Science: Where Does a Bootcamp Fit into the Equation? To transition from academia to industry, many choose bootcamps as a way to bridge the gap between the theory-heavy rigor of academia and the practicality of industry experience. In this post, hear from three such students who made the transition via bootcamp and who are now working in the field. In this month's edition of the Made at Metis blog series, we're highlighting two recent student projects that have to do with traveling to new cities. In the first example, a student explored new and improved ways to find places of interest while planning trips. In the second, a student set out to understand how and why musicians sought and found connections via Craigslist. As you enter the bootcamp, your computer screen is like a blank canvas, waiting to be covered with the messy excitement of ideas and projects, failures and successes. Projects are at the core of our Data Science Bootcamp curriculum and the philosophy surrounding it. A robust portfolio, demonstrating a wide understanding of tools and theories, along with a solid grasp of needed industry skills, is the central piece of the overall "why our graduates get hired" puzzle. See some final project examples here. Looking for a way to transition from consultant to data scientist, Tiffany Li turned to the Metis Data Science Bootcamp in Chicago. She's now a Data Scientist at GrubHub and was recently interviewed by Course Report about her career switch, the bootcamp vs. graduate school, and her current role. In this month's edition of the Made at Metis blog series, we're highlighting two recent student projects that focus on the intersection between transportation and data science. One project is a video-based car detector to improve safety for city cyclists, and the other presents a way to better forecast hourly Uber demand across New York City neighborhoods. We recently hosted a live Ask Me Anything (AMA) session on our Community Slack channel, with guests asking questions of Paul Black, Metis graduate and Jr. Data Scientist at DRIVIN powered by KAR. Below, we've included some highlights from the AMA session. It makes for a great read, especially for anyone interested in starting their own data science journey. In this month's edition of the Made at Metis blog series, we're highlighting two recent student projects that focus on the act of (non-physical) fighting. One aims to use data science to fight the problematic political practice of gerrymandering and another works to fight the biased algorithms that attempt to predict crime. Food and beer. One you need and the other you don't – but if you're anything like me, you sure enjoy them both quite a bit. In this month's edition of the Made at Metis blog series, we're highlighting two recent student projects that look to improve the status quo surrounding food and beer recommendation engines. Produced in partnership with SwitchUp, read an interview with Metis graduate Marcus Carney, Army Veteran and Data Scientist with CKM Advisors. Take a look at what's possible in just 12 weeks in this post, which features two final projects created by recent graduates of our data science bootcamp. James Cho predicted snowfall in California's Sierra Nevada mountains (which helps predict water supply) while Lauren Shareshian predicted home prices in Portland, Oregon. While working as a software engineer at a consulting agency, Sravanthi Ponnana automated computer hardware ordering processes for a project with Microsoft, attempting to identify existing and/or potential loopholes in the ordering system. But what she discovered underneath the data caused her to rethink her career. Read her story. Course Report, a most excellent resource for all things data science bootcamp, recently interviewed Metis graduate Jamie Fradkin about the evolution of her current role as a Data Scientist at BuzzFeed, where she's now worked for more than a year-and-a-half. Fradkin, a former biomedical engineer, attended our Data Science Bootcamp in New York City after a decision to switch careers because of her desire to make use of her math and statistics skills. Read the full interview! Read about two final projects completed by recent graduates of our data science bootcamp. Susan Fung explored neural networks using Justin Bieber lyrics, while Matt Murray created a song recommendation engine on JunoDownload. Emily Barry’s mind works in two distinct ways – she’s technological and analytics-driven, and she’s also creative to her core. That duality often left her wondering what career path to choose. Eventually, she found her way to data science. Read about her current role and how it satisfies both her tech and creative sides. Read about two final projects created by recent graduates of our data science bootcamp. Both projects focused on topics related to improving natural disaster relief efforts. He wanted to experience it all – every bit of its nearly 2,200 miles, over hills and mountains, through dense woods, and across multiple state lines. When Alan Schoen took six months to hike the Appalachian Trail, he’d just returned to the United States after 10 years of studying and working abroad. He was celebrating some in-between time by accomplishing an ambitious personal goal before diving head first into the competitive job search. And what he found afterward lined up with something he'd learned along the trail. During a conversation with a former colleague, Lillian Tong had an “aha moment.” As they discussed machine learning and how it could be applied to the work being done at their company, she felt a surge of interest and engagement that she hadn’t experienced in regards to any of her previous work. She took it as a sign. Lorena De La Parra Landa’s career spans the globe – literally. She began her career in international development before deciding to make the switch to data science. Read why and how she changed career paths and what she's doing to bridge the gap between the two in her new role at the data science firm CKM Advisors. First as a student of Sustainability and Environmental Management, then as a research assistant with the Urban Green Council, bootcamp grad Megha Jain didn’t necessarily envision her future career having such a direct tie-in to data science – for no other reason than being unaware of how the two fields could blend and push one another forward. Metis graduate Nelson Spencer is a Senior Analyst of Data Strategy & Analytics at Major League Soccer’s headquarters in New York City. He’s a soccer fan who grew up playing the sport, and he still plays to this day. Even so, he says the job’s main perk is the data itself, which grows in volume with the success of the league. How does the weather affect your food-ordering patterns? Do you eat more takeout in the colder months? Do you order delivery every time a little rain hits the ground? These are the types of questions Metis bootcamp alumnus Yong Cho has been thinking a lot about lately. Now a Data Scientist at Grubhub, he's figuring out the daily impact of weather on the business. While doing research on various bootcamps back in 2014, looking to transition out of her trade finance career, Jessica Freaner came across Metis and was drawn to the program based on the involvement of Datascope Analytics. The Chicago-based data science consulting firm was instrumental in developing the bootcamp curriculum and taught the first two cohorts in New York City, including Freaner’s. She now works there as a Data Scientist. Self-driving cars, once only existent in the realm of science fiction, edge closer to reality with each passing day. Data scientists like Galen Ballew, a graduate of the first Metis bootcamp in Chicago, are working day in and day out to make it so. This role is different for Andre Gatorano – and that’s a good thing. 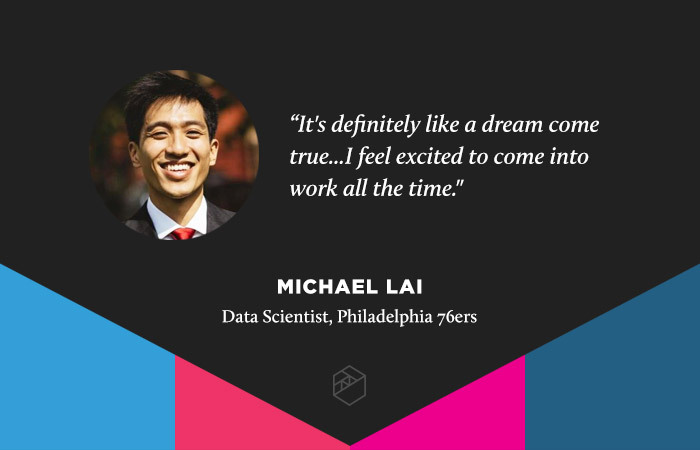 He’s now a Principal Data Scientist at Capital One, where he enjoys the fruits of the company’s noticeably strong commitment to a comprehensive data strategy. 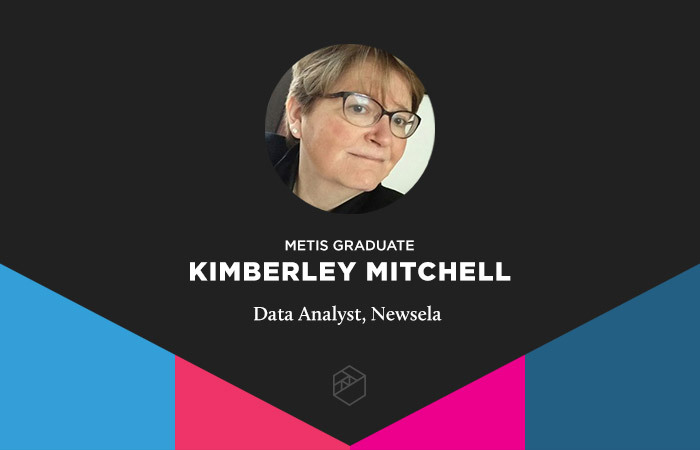 Bootcamp graduate Kimberley Mitchell, now a Data Analyst at Newsela, always had a significant interest in one crucial pillar of data science – statistics. This propelled her toward degrees in industrial engineering and economics, and into a career that has clear a delineation between before and after the birth of the mainstream internet. She worked as a Quality Engineer for AT&T and as a Statistician for Universal Instruments, among other roles, before the web took off and she wanted to take off with it. For Emily Hough-Kovacs, it’s not just about the final product when it comes to music. It’s about the intricacies of production, the record label, and the entire creative and business process. 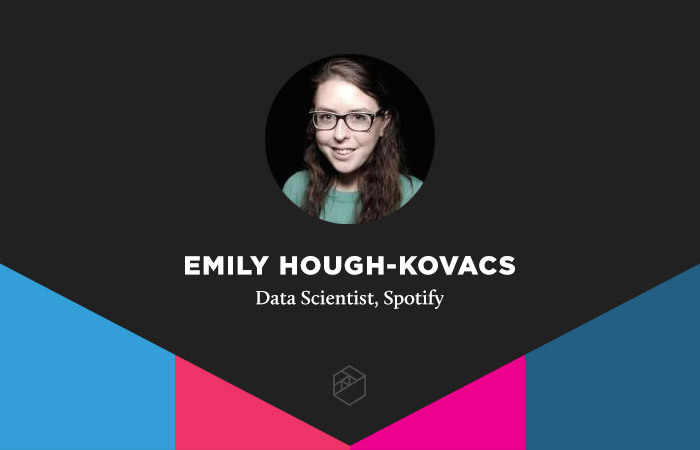 Now a Data Scientist at music streaming giant Spotify, she works on the Creator Products Insights Team. 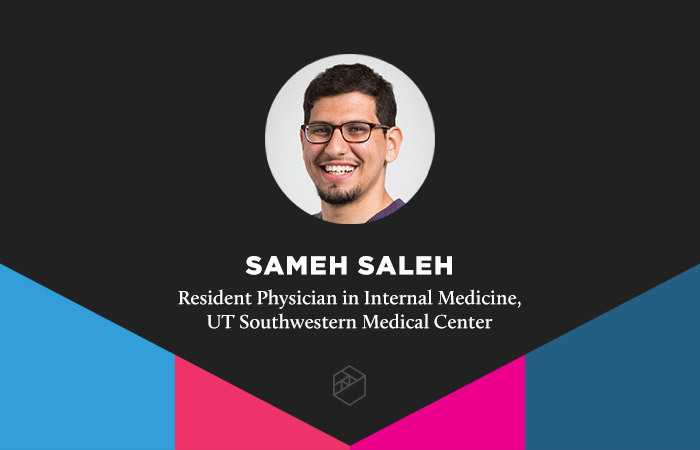 This post was written by Sameh Saleh, Metis Data Science Bootcamp graduate and current Resident Physician in Internal Medicine at UT Southwestern Medical Center. 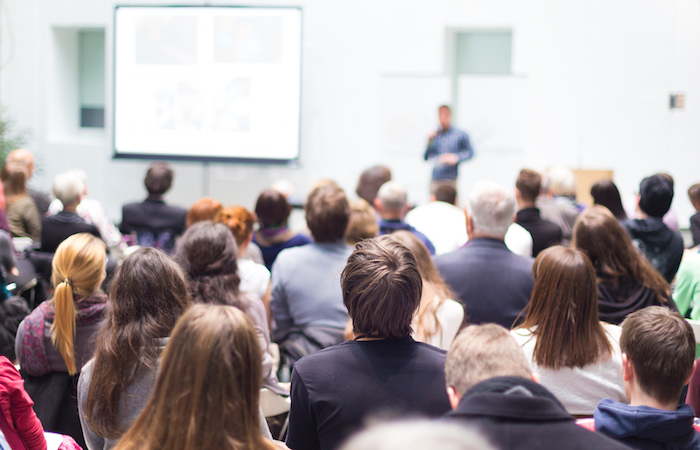 He shares his story with the hope to inspire other clinicians-in-training to seriously consider the value of a data science education in their lifelong medical endeavors. 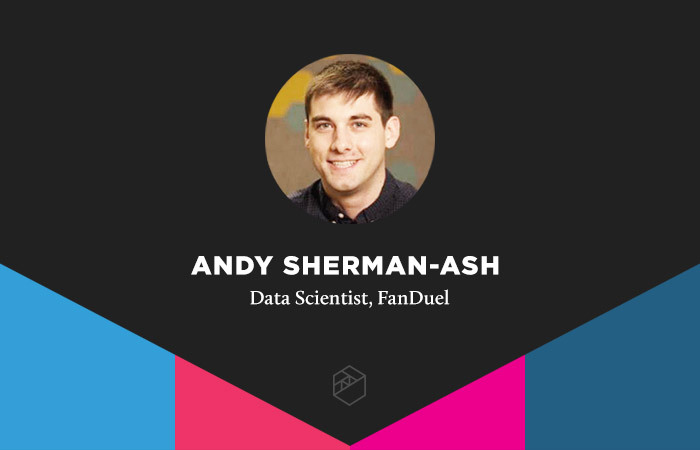 Before he’d even heard of data science, Andy Sherman-Ash was employing the powers of artificial intelligence in his career as a professional poker player. He taught himself how to code by crafting a neural network-based poker AI that used the machine learning software Weka. The road to a career in data science is often unpaved and unpredictable. 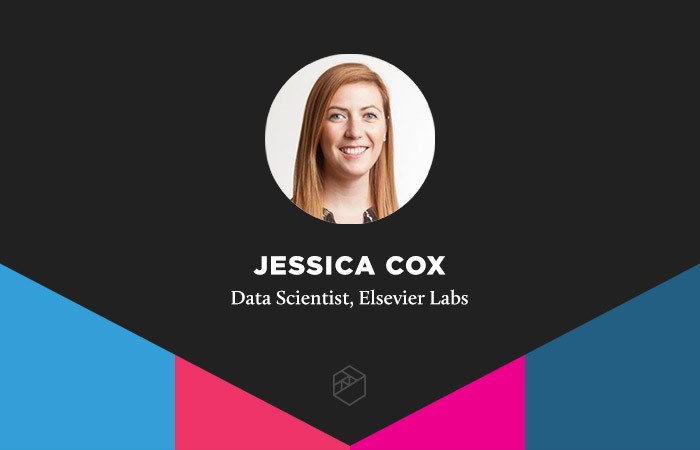 For Metis alumna Jessica Cox, it started with a bachelor’s degree in biochemistry and led to her current role as Data Scientist at Elsevier Labs, a scientific publishing company. During her undergraduate studies, she realized how much she adored research. She followed that passion through to a Ph.D. in Biomedical Science, focused on environmental health and nutrition research. That’s when another life-changing realization hit her: she loved data. As a Neural Engineering Ph. D candidate, Michael Palazzolo designed a virtual reality video game for primates. The data he collected was used to construct statistical models that charted the relationship between arm movement and vision to brain activity. While he enjoyed the interesting work – especially the parts that involved modeling and programming – at some point, it became evident that a career in academia wasn’t his desired path. He began seekings ways to fuse his academic expertise and experience with other desired skills. 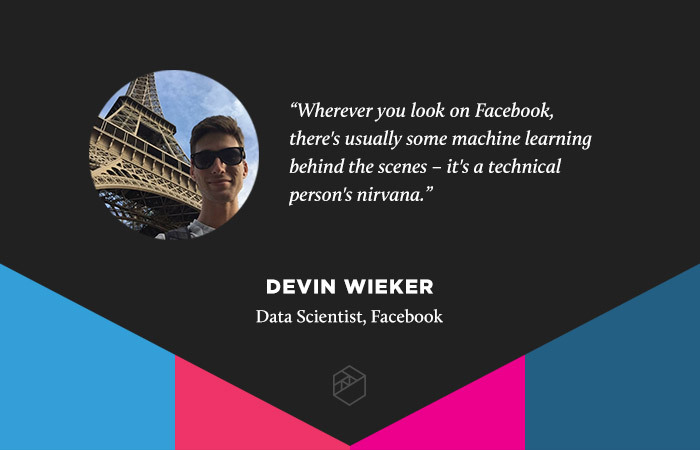 Metis graduate Devin Wieker is now a Data Scientist at Facebook’s Bay Area headquarters, where he’s focused specifically on Messenger growth and where he soaks in the highly technical work and environment. Like many Metis alumni, Max Farago came from a career quite different from data science. He worked for nearly four years as a lawyer – even running his own practice – and is now a Data Engineer at PreciseTarget, where he’s one of two people with a data background at the retail-oriented startup. Metis graduate Jamie Fradkin's work as a Data Scientist at BuzzFeed is applied to optimizing viral posts that you’ve probably read and shared hundreds (or more) times. Written by former Data Visualization student Corinne Brenner, this post explores a professional media project she enhanced for her job during her 6 weeks at Metis. Bootcamp graduate Alison Cossette came to Metis with 10 years of healthcare experience and a desire to integrate that with rigorous data science training. At the time of this Q&A, she was a Senior Analyst in Center for Healthcare Management at the University of Vermont Medical Center, working on data projects that directly impact patients' healthcare. She's since moved on to new, exciting roles in data science. At the time of this Q&A, Metis Data Science Bootcamp graduate Nathan Cheever was a Data Visualization Engineer at Ancestry. He spoke about his day-to-day work and how his bootcamp experience prepared him for it. He's since moved on and is now a Data Scientist at Front Analytics, a data science coaching and consulting firm. 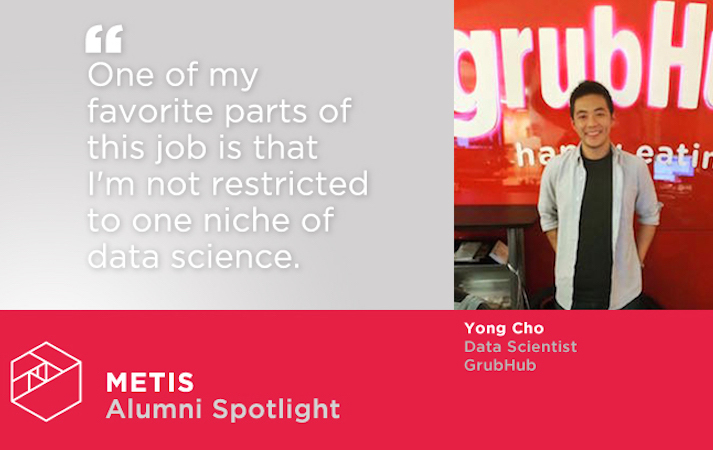 Metis graduate Yong Cho currently works as a Data Scientist at GrubHub, the food delivery company responsible for countless delicious meals delivered to my Brooklyn apartment. We caught up with Yong this week to ask about his role at GrubHub, his time at Metis, and his advice for current and future students. Jaclyn Weiser graduated from the Metis Data Science Bootcamp in July 2015, after which she joined ZeroFOX as a Senior Data Scientist. In this Q&A, she talks about her role at the social media cybersecurity startup, her time at Metis, and more. Since this article was written, she's moved on to new, exciting roles in data science. In an effort to prepare students for the job market, we hosted an alumni panel discussion in our NYC classroom, during which three recent graduates.